Hello fellow GBJammers! This is my first game jam! Not my first game though. Anyway, in honour of spooky month, and in light of the fact that I will only have evenings to work on it, I've decided to demake a game instead of coming up with an original concept. Hopefully, there are many other people here as old as I am, who also still have love for this classic title. So far, I've made some basic sprites (no animations yet), and have blocked out the first level, which is called The Docks. For two hours of work, I feel pretty good about it! 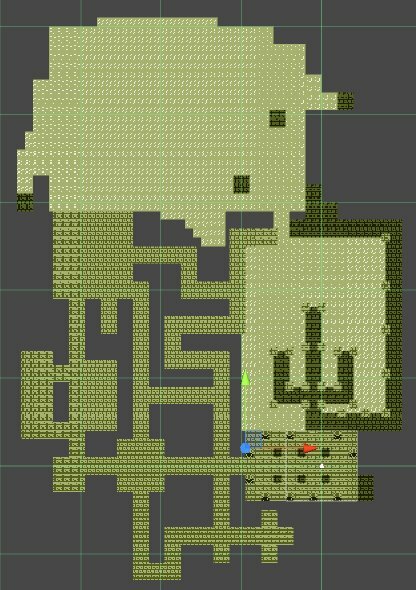 I'm hardly a pixel artist, but I feel happy enough to have made recognizable tiles and sprites within the 8x8 pixel constraint. Anyway, here, have some pictures! Sorry for the artifacts in the map, cropping the screencap donked it up pretty bad. Oh yes, I love that game. Would be awesome seeing a top-down version of it. And yeah that map looks about right. Did some work on basic player movement (KB & Gamepad both supported! ), collisions, and put in a HUD placeholder. What are you using to make this? My tip here would be to push back just after you've applied movement within the same tick. Also, you've got a few issues with your camera - I'm seeing some rather nasty subpixel artifacting. If it's Game Maker you'll want to manually set the camera left/top - try something like view_left=floor((x/4)-((160-60)/2)); if you are using, say, 4x upscaling. What's the zoom level here? With 8x8 tiles you'd fit 20 tiles wide, and w/o HUD 18 tiles high. If what you have is roughly the zoom level you want, consider going for 16x16 tiles (on real HW it'd be made up of 4 8x8 tiles). By the way, join us on Discord, I or someone else could possibly help you out a bit with your tiles. I recommend using more colours per tile here. Oh, haha I must've been tired last night. I literally didn't even consider how many tiles the GB shows at one time. So yeah, right now it's 8x8 tiles, so really I'll end up with more than twice as much screen real estate, which is fab. Thanks for pointing this out! It means I'll have to remake a bunch of the tiles, but the end result will be much nicer. I'm using Unity, actually, and I'm fairly certain that the collusion bump is a result of having the camera as a direct child of the player. This is just a placeholder so I could test the movement, I fully expect to resolve it when I actually get around to writing the camera script. I'll hop on the discord when I get home this afternoon (~2pm CST). If someone is interested in helping with sfx, music, or sprites, I'd definitely be interested in collaboration. You're making really good progress, keep it up it is looking great! Mini update, reworked some stuff from yesterday.